Behaviour is regulated by means of a balance between drives and brakes. Drives can be generated by the appearance of external stimuli and challenges or by the emergence of internal needs, either physical or emotional, including expectations andfrustration; brakes are the product of social rules, past personal experiences and maturity. 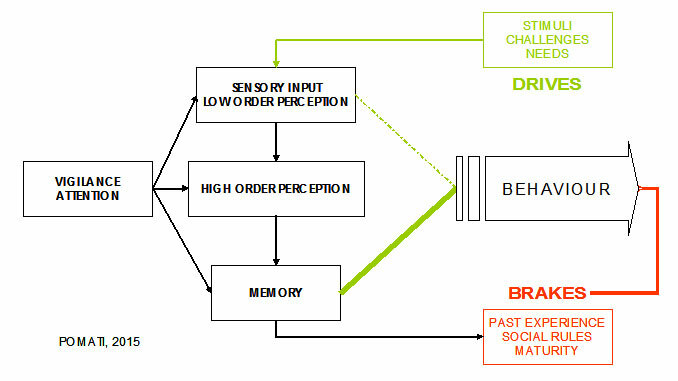 In order that a drive whatsoever determines a goal-directed behaviour, it must be processed (sensory organs, low and high order perceptual areas) and identified (memory); the appropriate response is eventually prepared and carried out; vigilance and attention establish a framework for the other functions to operate within. This scheme can be overcome by the need for a fast, lifesaving reaction, emotionally mediated, where the response goes through only a low order processing and is carried out in an almost instinctive way (figure 1). Aggression can be defined as a HOSTILE, INJURIOUS or DESTRUCTIVE behaviour. Impulsive aggression can occur in the context of emotional arousal and provocation in response to an immediate threat; the boundaries between physiological and pathological response are loose: individuals with pathological aggression may experience or rationalize their violence or aggression as being within the borders of normal protective or defensive aggression. Otherwise aggression may represent a planned, premeditated conduct (predatory, proactive aggression). Case studies and reports, mainly in individuals with traumatic lesions but also in psychiatric populations, consistently relate the emergence of aggressive behaviours with a damage to the frontal lobes of the brain, the regions involved in the regulation of conduct. The archetype is the case of Phineas Gage, a victim of a work accident described in 1848 by John Harlow, who after the “passage of an iron rod through the head” suffered major personality changes and developed impulsive and aggressive behaviour. Frontal functions are essentially organized in executive (such as planning and checking), inhibitory and volitional tasks, respectively attributable to the dorsolateral, orbital and mesial (i.e. the most internal) portions of the frontal lobes; it follows that frontal functions, particularly those of the orbital and internal portion, act essentially as brakes. The poles of the temporal lobes and the amygdalae, small structures nearby, are engaged in emotional arousal (fear and rage). Frontal and temporal lobes are also involved in the Theory of Mind, the ability to attribute mental states — beliefs, intents, desires, pretending, knowledge, etc. — to oneself and others and to understand that others have beliefs, desires, intentions, and perspectives that are different from one's own. Any condition that disrupts the scheme illustrated in figure 1 can contribute to the emergence of an inadequate behaviour (see figure 2). 1 – a low level of vigilance and attention (e. g. drowsiness and confusion but also apathy) hampers every other activity of the brain. 2 – an impairment of sensory (e.g. loss of vision but also inadequate environmental lighting) and of perceptual functions can determine a distortion of the initial stimulus, eventually with a delusional misinterpretation. 3 – the loss of memory (as seen in dementia) interferes with the recognition of the initial drive and prevents the use of previously learned (socially) appropriate responses. Impulsive aggression may thus be regarded as a lower threshold for the activation of an inadequate behaviour (i.e. aggressive responses) to challenging stimuli without adequate reflection or consideration for the consequences of such behaviour. Regions most commonly activated in moral judgment tasks consist of the orbital and mesial prefrontal cortex, amygdala, angular gyrus, and posterior cingulate: some common ground exists between the neural circuitry underlying antisocial, violent behaviour and moral decision making. In the context of psychopathy, a lack of empathy and unsympathetic behaviour toward others may lead to proactive aggression with the antisocial and even criminal acts characteristic of antisocial personality disorder. A susceptibility to aggression may be facilitated by an altered mood or anxiety state, as in bipolar disorder, generalized anxiety disorder, or panic disorder. Subjects predisposed to anxiety who are later exposed to trauma may exhibit aggressive acts when triggered by cues that evoke the original trauma, as in the context of posttraumatic stress disorder. Physical and verbal aggressive behaviours are among the most common and persistent behavioural symptoms of dementia; they cause great distress in family members and caregivers and are one of the leading reasons for institutionalization or access to emergency wards. Twin and family studies suggest that aggression, particularly impulsive aggression (as differentiated from premeditated aggression), has substantial heritability. Gene-environment interactions play a major role in aggression and antisocial behaviours. Environmental factors comprise familial factors, including observing or experiencing aggression as a child or adolescent, as well as cultural and socioeconomic factors that lead to aggression. At the level of cell signalling, neurotransmitters display different actions in relation to pre- and post- synaptic activities and the receptors involved; neurotransmitters can act as agonists if they increase the activity of a system or as antagonists if they reduce it. Serotonin (5-HT) has been implicated in the neurobiological mechanisms of aggression and violence more than any other molecule in the brain. 5-HT2 receptors are involved in the modulation of orbitofrontal and anterior cingulate cortex: antagonists of 5-HT2A (such as atypical neuroleptics, a class of drugs acting on the brain, usually employed in the treatment of psychosis) and agonists of 5-HT2B display efficacy on aggressive behaviour. Increased noradrenergic sensitivity is related to hyper-reactivity to the environment, indirectly enhancing the likelihood of aggression. Dopamine is involved in initiation and performance of aggressive behaviour. Cholinergic system modulates the activity of the subcortical and limbic regions: an hyperactivity of the cholinergic system can lead to dysphoria or irritability, triggering aggression. The same effects have been reported for an imbalance between glutamate and gamma-amino-butyric acid (GABA). Oxytocin is implicated in affiliative behaviours and trust: deficits in oxytocin might contribute to the hostility, fear, and mistrust that may provide the preconditions for the emergence of aggression. High levels of vasopressin correlate with life history of aggression in personality disorders. Reduced opioids may be associated with increased abandonment distress and rejection sensitivity that may heighten the likelihood of aggressive behaviour. Dramatic relief of pain may result when opiates are released in the context of self-injurious behaviour, due to an imbalance between pre- and post-synaptic activities. High concentrations of testosterone have been reported in populations characterized by high aggression, including criminals with personality disorders, alcoholic violent offenders, and spousal abusers; steroids may induce aggression and enhance responsiveness of brain circuitry related to social aggression. Aggression can be passive (obstinacy, stubbornness, uncooperativeness) or active; verbal (screams, offensive language, threats) or physical (hitting, kicking, biting); direct or indirect (e.g. : mediated by objects); the target may be the self or the others. Several rating scales have been developed to reveal and measure the different aspects of aggressive behaviour and the impact on caregivers and setting; the Neuropsychiatric Inventory (NPI), the Behavioural pathology in Alzheimer's Disease rating scale (BEHAVE-AD), and the Rating scale for AGgressive behaviours in the Elderly (RAGE) are the most widely used instruments in the context of aging / demented populations. Behavioural and environmental interventions play a critical role in the management of aggressive conduct and may help to reduce the current excessive use of neuroleptics or other sedatives (and it should be remarked that sedatives, lowering the levels of vigilance and attention, may increase the risk of impulsive aggression). Psychotherapies, either psychodynamic, such as transference-based therapy, or behavioural, such as dialectical behavioural therapy, may serve to increase the capacity to delay and inhibit aggressive behaviours, increasing verbal / reflective function capacities as well as helping to reduce excess sensitivity to emotions. A final consideration is that if offenders are not fully responsible for the source of the brain dysfunction that impairs their moral decision making, this raises significant neuroethical issues regarding the appropriate level of punishment for those who show morally inappropriate acts. Gauthier S, Cummings J, Ballard C, Brodaty H, Grossberg G, Robert P, Lyketsos C (2010) Management of behavioral problems in Alzheimer’s disease. International Psychogeriatrics 22, 346–372. Goedhard LE, Stolker JJ, Heerdink ER, Nijman HLI, Olivier B, Egberts TCG (2006) Pharmacotherapy for the treatment of aggressive behavior in general adult psychiatry: A systematic review. The Journal of Clinical Psychiatry 67, 1013–24. Gothelf D, Apter A, van Praag HM (1997) Measurement of aggression in psychiatric patients. Psychiatry Research 71, 83–95. Patel V, Hope RA (1992) A rating scale for aggressive behaviour in the elderly – the RAGE. Psychological Medicine 22, 211–21. Patrick CJ (2008) Psychophysiological correlates of aggression and violence: an integrative review. Philosophical Transactions of the Royal Society B: Biological Sciences 363, 2543–2555. Reisberg B, Monteiro I, Torossian C, Auer S, Shulman MB, Ghimire S, Boksay I, Guillo BenArous F, Osorio R, Vengassery A, Imran S, Shaker H, Noor S, Naqvi S, Kenowsky S, Xu J (2014) The BEHAVE-AD assessment system: a perspective, a commentary on new findings, and a historical review. Dementia and Geriatric Cognitive Disorders 38, 89–146. Rosell DR, Siever LJ (2015) The neurobiology of aggression and violence. CNS Spectrums 20, 254–279. Siever LJ (2008) Neurobiology of aggression and violence. American Journal of Psychiatry 165, 429–442.